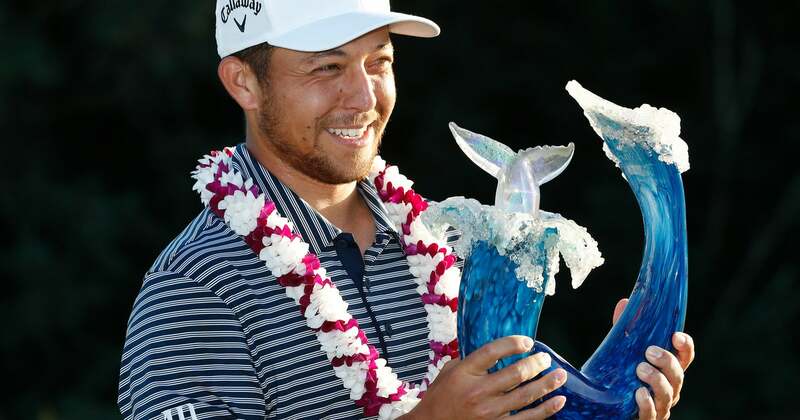 KAPALUA, Hawaii (AP) — To say that Xander Schauffele has come a long way depends on the view. Eighteen months ago, Schauffele had played 18 times on the PGA Tour and missed the cut in half of them. But after he tied for fifth in his first U.S. Open at Erin Hills, the 25-year-old from San Diego has taken his place among golf’s emerging generation of stars. 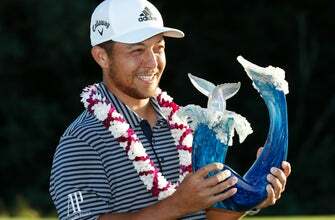 Schauffele picked up his fourth PGA Tour victory Sunday when he holed two shots for eagle, nearly chipped in for two more and finished with two clutch birdies for an 11-under 62 to win the Sentry Tournament of Champions at Kapalua. He tied the Plantation Course record and set tournament records for the lowest closing round by a winner and largest comeback over the last 18 holes (five shots). The victory, his second of the PGA Tour season following his HSBC Champions title last fall, moved him to No. 6 in the world. Watching the trophy presentation was Alex Nakajima, the general manager at Kapalua Resort, whose view is much longer than 18 months. He first saw Schauffele before the boy could even hold a golf club. It was 1994, when Nakajima was an assistant pro at Princeville on Kauai. The club had just hired Stefan Schauffele as an assistant, who never finished his PGA certification but knew enough about golf, passion and determination to pass it along to his son. “It’s awesome,” the father said as he spoke of his brief time on Kauai, and the friends who were at Kapalua to watch the riveting charge Sunday. Schauffele doesn’t get wrapped up in anything but the shot in front of him, so he wasn’t amazed at his progress in 18 months, or from the time he was 8 and his father wouldn’t let him play unless he could carry his own bag. Nor is he willing to inject himself into the category of the best young players in golf. He is part of the fabled high school class of 2011, which includes Jordan Spieth, Justin Thomas and Daniel Berger. Spieth and Thomas already have risen to No. 1 and won majors. That’s where Schauffele wants to get. In his four victories, he overcame a three-shot deficit to win the Greenbrier Classic, a two-shot deficit to beat Thomas at the Tour Championship in 2017, a three-shot deficit to win his first World Golf Championship in Shanghai, and a five-shot deficit to beat the winners-only field at Kapalua. He is one ranking spot behind 25-year-old Bryson DeChambeau, who has four PGA Tour victories. He is one spot ahead of 24-year-old Jon Rahm, who has two PGA Tour victories and three on the European Tour. Did anyone see this coming when he won a playoff for one of the last spots in that 2017 U.S. Open at Erin Hills? As a young man, Stefan Schauffele was invited to train for the decathlon with the German team. He was trying to master the pole vault when he was hit by a drunken driver on his way to the training center and lost his left eye. He also lost the chance to compete in his favorite activities — skiing, diving, weightlifting, anything that put pressure on his eye. When he moved to San Diego, he wound up living next to a golf course and was intrigued by the sport because the ball didn’t move. And then he was hooked. He spent two years in Hawaii and returned to San Diego, where he shared the game with his son. Schauffele was the PGA Tour rookie of the year in 2017, and his father was never more proud. The next question is how far he goes. For now, Schauffele is still rising and chasing flags.